A custom Birth Plan poster! Keep it happy, bright, and easy to look at! A fun, colorful, and simple quick-reference for nurses that will give mom peace of mind and make the medical team smile (because they won’t have to read through 19 pages of blocks of text to know that you want your toenails painted aqua-fairytail green by Jim the handsome male intern 12 minutes before you push baby out). Know anyone having a baby? Send them to HeyHeyDesigns for their own! 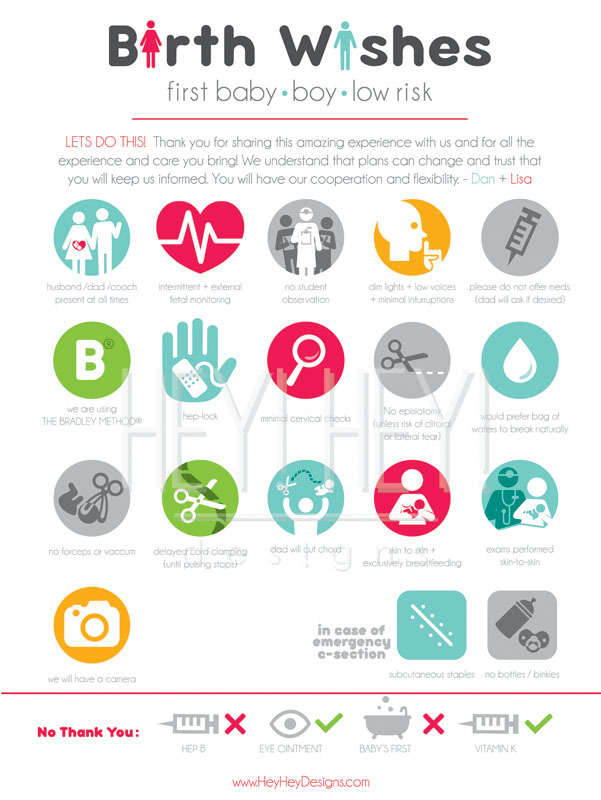 How does one make a birth plan poster? I don’t see a link. Plus, is there an icon to forbid infant circumcision? It’s vitally important to me to keep my baby whole. So how it works is you fill out a contact + order form at the top of my page with the icons you would like me to make and whatever other content you are looking for. From there I can give you a price and I would send the final image your way to have printed at your preferred location.